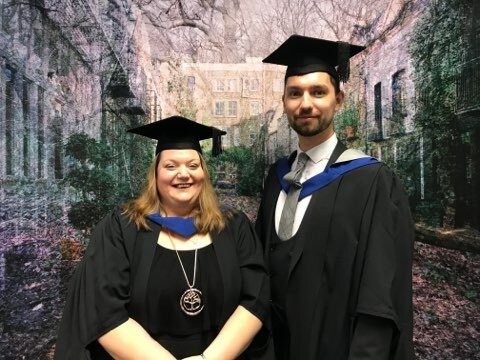 We are proud to announce that two more Willow Dene teachers have completed their MA degrees in Leadership and Innovation. Lisa Parascandolo and Joshua Garrett Smith have now passed the two-year course with distinction. On Friday November 16th they graduated from the University of West London. Lisa and Joshua were able to celebrate the day with their families and also met business executive Claude Littner who is the patron of the UWL Claude Littner Business School. The MA course which was funded by the school involved two years of study centred around school-based research. Teachers were able to teach full time whilst completing the course because the tutoring takes place locally, in one of the Compass Partnership schools and because the main focus of the study is centred on what happens in school. Participants are encouraged to identify a ‘wicked problem’ which is specific to their setting and then to design their research to address this. Lisa’s research involves developing an approach which complements the Move programme and supports a breadth of opportunity for children developing functional movement skills. Joshua’s research supports staff to develop skills, knowledge and confidence in the context of their roles and is centred round a bespoke CPD App. Both research projects have contributed significantly to Willow Dene’s school improvement. The final modules of the MA focus on making research projects scalable and exportable so that they can positively affect a greater audience. There are now four Willow Dene teachers who have completed an MA in partnership with the school and UWL. All four research projects have impacted positively on the school and Willow Dene has been awarded the status of designated ‘research hub’ for UWL.